Chelsea defender David Luiz has reportedly agreed to put pen-to-paper on a fresh one-year contract with the west London outfit. The Brazilian's current deal is due to expire at the end of the season but his agent has recently been in London to discuss a contract renewal. According to Goal.com, the club are said to have found the breakthrough with Luiz's representative and the defender is now expected to sign a new one-year deal. 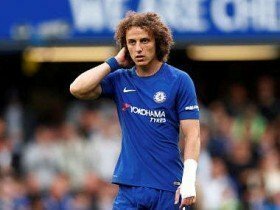 Luiz was previously reluctant to accept less than a two-year extension with the Blues but it seems that he has eventually agreed to a 12-month renewal, given his crucial role under Sarri. The centre-back had a forgettable 2017/18 season where he managed just 10 appearances in the top-flight but things have changed under Sarri, where he has been nearly ever-present for the league duties. Luiz re-joined the Blues from Paris Saint-Germain in the summer of 2016 and he has since won one Premier League and FA Cup crown with the west London side.